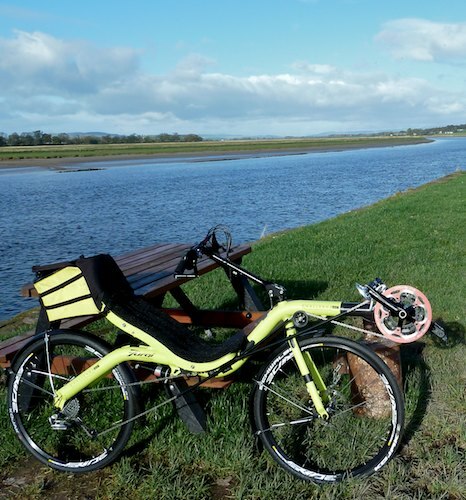 John’s Nazca Fuego is a popular “Readers’ Bikes” entry, and I’m pleased to be able to add this article by John to the site, this time featuring his Challenge Furai — Dave. Over the last few years I have owned and ridden a good few bents, from stick bikes to low racers. My first bike was a Nazca Fuego and I eventually went back to this model as it is, for me, a near perfect all-rounder. The Furai also caught my eye and I did have a brief ride on a 24” all-rounder version. Later, I read Dave’s review of the Furai based on a very wet short tour in the Highlands. It came across as a bike with many similar qualities to the Fuego but with a bit less weight and a slightly higher seat. Intriguing. Then last year David at Laidback told me about a 26” version he had taken as a trade in. I travelled up to view it, tried it and bought it. My bike started life, I believe, as a 24” model. Challenge supplied a replacement fork. I made one or two changes. I substituted a pair of wheels comprising Shimano XT hubs and Mavic XC717 rims (a personal favourite), a SRAM PG990 9 speed cassette and fitted 28mm Schwalbe Durano tires. I lowered the gearing by fitting a Shimano XT 26/36/48 ATB chainset. I am using a Bacchetta Big Bag as a seat pack for stuff and a bottle cage is mounted on the stem. All the changes went smoothly and the finished bike, ready for the road with mudguards, bottle cages, computer, Ventisit and pedals came to approximately 14kg. All that remained was to wait for the blessed rain to stop!! When I first rode the bike I felt what appeared to be a slight hint of wheel flop at low speeds. It disappeared at anything above walking pace. After I fitted the carbon seat this characteristic had vanished. Either I had dialled this out of my consciousness or the slight shift in weight distribution eliminated it. Directional stability is excellent, yet it responds quickly to steering inputs. Changes of line feel secure with no feeling of under or over steer. Across cratered surfaces it holds its line well and the narrow tyres seem to cut through some of the muddy surfaces left from the winter storms. Brakes, as you might expect, are superb with power and good modulation. I have had no issues with the idlers. I wonder whether chain tubes (which are installed) prevent the chain leaping off? Perhaps chain length and therefore tension plays a part? Some time ago I remember reading a number of posts on BROL forums concerned about the potential for heel strike on a Furai 24. It was some weeks after I got the bike that I remembered and looked up this thread. Up to that point I had not thought about or experienced heel strike. It certainly can occur (though there is no hard interference between cranks and wheel) but in practice it is a non-issue. In Dave’s report of the 24” version he mentioned the issue of pannier bags rubbing on the swing arm. I haven’t ridden the bike with panniers (Radical Bags) however when I offered them up they looked as though they clear the swing arm. The only difference is that Dave was running the SL narrow seat and the standard seat is at least 2 cm wider. There might be an issue with sway but that is easily dealt with by tying the bag to a convenient point on the rack. I realise that hard shell seats suit me well and comfort levels are excellent. The rear shock does its stuff. There is no sensation of pogo-ing. The bottom bracket is, for me, just the right height above seat level. Performance riders may wish it to be a little higher. Combined with the moderate seat recline the BB height gives me a good view of the road surface immediately in front. The unsuspended front does transmit some road shock but the longish wheelbase helps mitigate the effect on the bike. Seat height is 55/56cms. You sit between the wheels and because of the shape of the seat reaching the ground is easy. I’m 6ft with an X seam of 42.5” and inside leg 32” i.e. short legs / long torso. At junctions I can sit comfortably with one foot clipped in and the other flat on the ground. Ergonomically this is a very friendly machine. Compared to big wheel stick bikes I have owned the Furai delivers better comfort, seat height, weight distribution and bottom bracket height all without any significant weight penalty. The narrow handlebars – slightly V shaped – are excellent for fast riding. They give you a real feeling of being tucked in to a cockpit. The folding stem looks fabulous but isn’t. The clamp that sets the handlebar height is woefully inadequate and the ‘bar height continually slips out of adjustment. A solution is easy though. Take one slightly bent target archery arrow, cut a portion of the shaft equivalent to the width of the clamp, squeeze gently in a vice until it will slide into the space underneath the clamp and presto you have limited the distance the clamp can move! Shouldn’t be necessary though. The first time I rode the bike I took it over my short hilly circuit and immediately felt it climbed faster than the Fuego. I seemed to be one gear up all the time. Downhill was good but not as good as a low racer of course. And into the wind it is marginally slower as well. Where a big wheeled bike shines is on less than perfect surfaces. It just seems to roll better over them. And coarse surfaces abound round here. Over a number of rides I would say that my average speed was consistently 1-1.5 kph faster than the Fuego. I put that down to lower weight and less rolling resistance. It is winter and these figures are the result of moderate (not performance) riding efforts. On steep grunty climbs the bike feels very stable and seems to be able to drop to near walking pace and still hold a reasonable line. Overall I would describe this as a swift, smooth bike with good ergonomics. It is not a racer but feels as though it will make an excellent Audax / long day ride bike. It is very versatile. 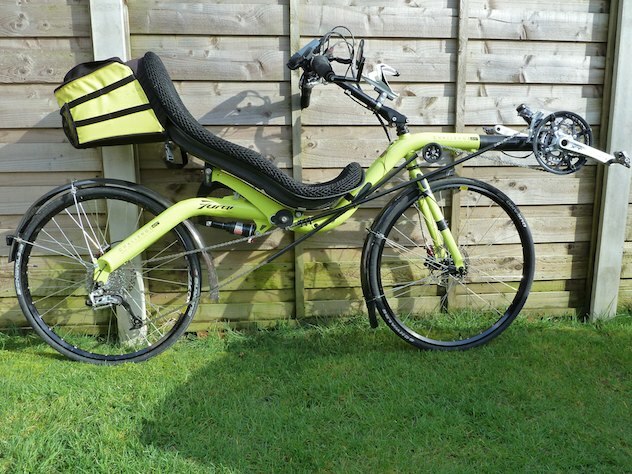 With the standard Challenge aluminium seat fitted it can take a rack and panniers and feels robust enough to carry a load. One of the tests I use about any bike is to observe how I use it after the initial novelty has worn off. The Furai gets picked as often as any of the others. It must be good! I look forward to warm days with no mudguards and some longer rides. A great bike – and like so many Challenge products it looks great. Tiller: I agree that the Challenge tiller is a shocker, especially the older design. I ended up pick-up an HP Velotechnik tiller from Bikefix which is *awesome* in comparison. Challenge/Elan: I was surprised that they sent you a seat; are they still making and selling bikes? I’ve been thinking about scrapping my Seiran as it wears out and moving to Azub, partly because I thought they’d gone bust. @Dave: see you at Harry’s wedding? My ‘modified’ new style tiller now works great but adjustment means making a new insert to change the vertical adjustment of the ‘bars. Easy enough done. Persistence seemed to work. After a lengthy silence Challenge / Elan offered me all the bits I needed. I ordered one weekend and they were here by Friday! I got the impression they are very busy but will eventually respond. Just caught this now. Good work and nice to have another review of this model. You do temper this with proviso of route and the fact that Fuego is maybe more versatile in some ways. Nazca don’t really have an equivalent twin 26 design. In fact no-one has unless you look at the MetaBike 26 offerings. Luggage choice on Furai is less than the Seiran as it really is an SL frame. So forget big Voyager style racks or anything like the excellent Nazca Fuego Midrack. If you do hang stuff over watch out for bags rubbing and taking the logo off the rear swing arm. The bike you had was owned by someone that races with BHPC and they did pretty well on it – even on the original 24″ wheeled version. Challenge did originally promote this as the ‘real’ Furai but I’ve since decided that twin 26 is the way to go on this unless you are ‘not so tall’. Although I’ve sold various Seirans although I do prefer the ‘in the bike’ sensation of frames with lower seat heights. The Seiran SL (very light) is rumoured to be going off the Challenge range to be replaced by the Chamsin which will sort of overlap with the Furai as a racier 700c version. The suspended Seiran models will remain and they offer underseat steer. The 2013 LEL Audax featured one bought at Laid Back and equipped with the same Mavic wheelset built up by The Bicycle Works. It also featured a SON hub with the B+M Luxos . Hydraulic brakes on your Furai were fitted by previous owner. His came from LB too and had underseat steer. The Furai can have all steering types that Challenge offer. Underseat frames though have extra bosses on the underside of course so if you like playing with steering start USS. Comparing with the rest of the market…. other USS offerings tend to be more robust long haul machines like the Gaucho 26 and Azub Max or Ibex. The Furai therefore is in its own category as far as I can see although clearly related to the Fujin Suspension Tour model with similar swing arm and seat to B/B relationship. The Furai is lighter though. For a light Fujin you need an SL non suspension model. Challenge are still producing bikes and I’m happy to take orders for one of these providing people can wait. Hans recently got me a replacement front fork for a Fujin and a Velocity 406 front wheel. in my view the Furai offers riders the archetype Challenge style whilst allowing them to get their own wheelsets if they wish. In comparison with their original best selling Hurricane it feels better, works better and looks better partly due to running larger wheels and a lighter frame with more options. Steerer could be improved although you can in fact get on it with a rigid steerer which this one had at first. David, could you tell me about possibility to install a Challenge’s special suspension fork on Furai? I remember that a few years ago there was such option. …and is there large alu seat or not? I like carbon. But the carbon seat, I see, can not be sunk into the frame quite deeply because of the idler. I’d like to have seat height on Furai 26/26 about 50 cm but not 56 or so. I see with alu seat it would be possible. My height is 186 cm, so I think small SL seat will be not fitted to me. There is (or was) a range of seat sizes available in the non-SL model. SL was only in medium. I’m not clear now what exactly is possible – I would get in touch with the new owners of Challenge (or with David Gardiner at Laid Back Bikes) to discuss your requirements and see what they come back with. Thank you for response Dave! It would be really nice to get answer from owners .